FLAX is such a powerful seed that it is now again called a medicine. As they say, “Let food be your medicine.” Research has now proven what our forefathers and even the Egyptians in 5000 B.C. knew about flax. They used flax as a prevention and cure for diseases. Today research tells us that flax contains many beneficial nutrients that can help prevent and treat diabetes, high blood pressure, heart disease, inflammatory & autoimmune diseases such as rheumatoid arthritis, psoriasis and lupus, menopausal symptoms & some cancers. A suggested amount that was used in many trials is 1-3 tablespoons, so Winnie decided to create many delicious recipes for muffins with 2 heaping tablespoons of crushed flax in each. Now it is easy to enjoy one of these muffins and not think of it as a medicine, but as delicious food. There are healthy savory muffins & healthy sweet muffins, muffins for everyone, even children. Each muffin recipe in A MUFFIN A DAY cookbook comes with a nutritional analysis and detailed instructions. Bake a variety of muffins and freeze them so everyone you serve will be able to have the kind they like. And now there is another kind of muffin! 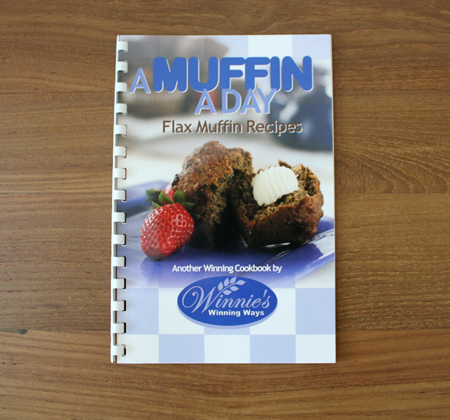 As well, Winnie has now added 2 very special muffin recipes to this cookbook that take only a minute to bake in the microwave . . . in a large mug! Just mix the batter in a large round mug, microwave a minute and you have a huge muffin that also contains 2 heaping tablespoons of flax. These 2 recipes have only flax flour so they are great for anyone who cannot have gluten or grains. When we want that extra 2 tablespoons of flax or for those who want a more enjoyable way to eat flax, it can be enjoyed in a delicious muffin! This attractive, yet inexpensive cookbook will make a wonderful gift for someone who isn’t feeling well or maybe someone who is trying to eat with nutrition in mind. To celebrate the new “Canada Food Guide” that just came out this week, in January of 2019 Winnie is offering a discount of 50% off the regular price of her 3 Healthy Seedy cookbooks.